I see no reason why this isn't a goal. 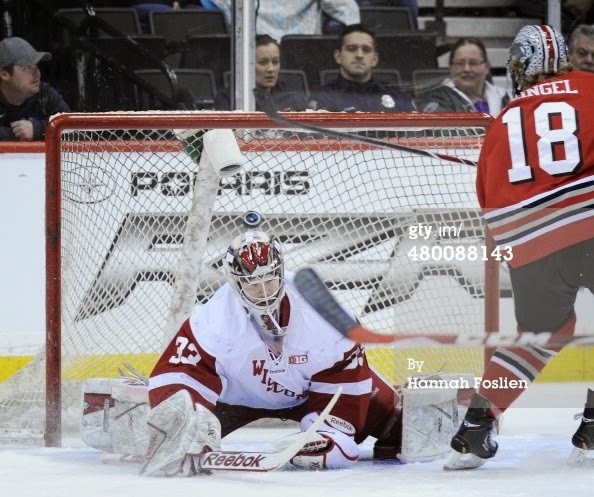 The Northeaster forward is not in the Minnesota crease before the puck is in the net. There doesn't appear to be any contact with the goalie. I think this is a blown call by the B1G officials. Your thoughts. When the NCHC was formed, the league was going to do things better. That was one of the premises of breaking away from the WCHA schools. That status quo was no longer acceptable and needed to be changed. One of the big selling points of hiring head of officials Don Adam was that the NCHC was going to work on training their on-ice officials. Almost two years into this new league, the NCHC is still plagued by many of the same issues that were front and center in the in the old WCHA. You have a great on-ice product that's officiated by sub-standard officials. In my opinion, the NCHC has officials that shouldn't be reffing games at this level. This past weekend, NCHC officials Timm Walsh, Nick Krebsbach were absolutely brutal. Words can't explain what transpired. So, you have a video to watch. First, you have a legitimate goal that should have counted. As you can see by watching the video, that the puck was clearly over the line. There's no reason that goal shouldn't have counted. Watch the video, the puck was clearly over the line and in the net. The argument of the ref was going to blow the whistle, doesn't cut it in this instance.You have a puck that's not frozen and in play. If the refs were going to blow the whistle, there's no reason to spend five minutes reviewing the play. Right? The second play, the puck is clearly not in the net and the refs take quite a bit of time to review the play. After watching the video, I can see why the Gophers are having a tough time. It's pretty simple, if the Gophers don't start winning hockey games, they will be sitting home for the NCAA tournament. Right now, they're not a good hockey team. It's kind of puzzling. 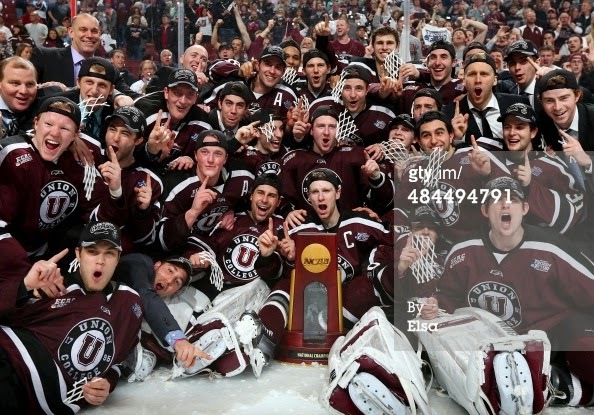 Minnesota returned most of the team that went to the Frozen Four last season and finished as the runner-up. After you watch these goals, you will see why the Gophers losing. They're getting beat to pucks. They're not strong on pucks. They're losing the battles. They're not going to the hard areas. The Gophers All-American goaltender Adam Wilcox looks human. Wilcox is getting beat by shots at the top of the faceoff dots. That didn't happen last season. As promised, the video highlights of game two between UND vs. UMD game. I think the boys in stripes has a rough weekend, all weekend long. Also, I included the first penalty of the game. Mark MacMillan was hit with a shoulder/elbow in the head by UMD defensmen Andy Welinskito, this should have been a five-minute major. Some had made the argument that Steph Pattyn should have been tossed from the game. The Duluth player definitely embellished the call. It was a good weekend of hockey. Feel free to chime in with your opinion. Others receiving votes: Omaha 78, Robert Morris 67, Notre Dame 62, Bowling Green 47, Michigan Tech 36, Merrimack 27, Northern Michigan 24, New Hampshire 21, Princeton 17, Ohio State 14, Yale 10, Dartmouth 6, Harvard 6, Northeastern 6, Bemidji State 2, Clarkson 1, Mercyhurst 1. Others receiving votes: Alaska 45, Vermont 33, Cornell 27, Notre Dame 18, Robert Morris 15, Minnesota Duluth 14, Omaha 14, Yale 9, Alaska Anchorage 8, Bowling Green 6, Merrimack 6, Michigan Tech 5, Ohio State 3, New Hampshire 1, Bemidji State 1. Others receiving votes: Denver 21, Michigan Tech 14, Massachusetts-Lowell 14, Minnesota Duluth 12, Northeastern 10, Michigan State 8, Yale 8, Quinnipiac 6, Ohio State 5, Robert Morris 4, Bowling Green 2, New Hampshire 1. There has been a lot of hockey news in the past day or so, and more coming from the Minnesota Wild camp today as well, and no it isn't anything about the Darcy Kuemper situation. The Wild have announced an affiliation with the ECHL's Alaska Aces. The Aces have been very successful as a franchise in the past few seasons, winning three Kelly Cup Championships in the past nine seasons, including this past season. Included in the agreement, according to wild.com, the Aces will serve as a resource for developmental efforts for both Iowa (AHL) and Minnesota. UND fans may take notice at a familiar face on the Aces roster, and now in the Minnesota Wild system, Evan Trupp. Trupp played four years at UND and was a member of the Aces for their championship winning team last season. If you haven't seen this, it's worth a look. Former Warroad Warrior and Minnesota North Star Henry Boucha let Clyde Bellcourt and the National Coalition Against Racism know how he felt about their efforts to get Warroad to change it's logo. These comments were posted on his Facebook account. 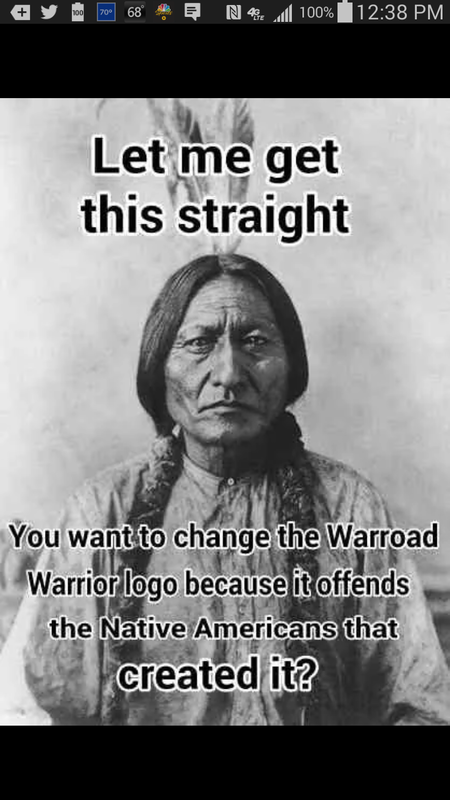 “It the late ‘80s, early ‘90s, the Warroad Indian Community, the Indian Education Department and the Warroad Indian Parent Committee supported keeping the name Warroad Warriors. [The Warroad Indian Community] still does today! “We are proud of what the Warriors represent. Warroad [Kay-Bay-Kah-Nong] is derived from War Road, a trail to the West where the Warriors (our ancestors) traveled down to fight and battle the Sioux. We fought many fierce battles and won the war, keeping our land on Lake of the Woods. “This is what the name is all about, and we are proud to have it. “The Indian Parent Committee and the Warroad Indian Community designed the logo for our school. We use it today and wear it with pride. “We haven’t had a mascot in 40 years. No-May-Poke, a brother to KaKaGeesick and Little Thunder, sold part of his land allotment at a very reasonable price to the Warroad School. It was at [that] time the Warroad Warriors name was instilled, with pride. “This issue should be left to the communities to decide. Warroad decided once, and we’ll keep the name! Take the hint, Clyde, and go back to the noble task of getting rid of the Washington Redskins. Boucha posted this picture on his facebook page. Ok, I know that the season is still two months away, but I just can't get over how this one ended, and not just for North Dakota either. In general, this past season saw a lot of parody and I expect this season to be just the same. We saw a team with just one NHL draft pick win it all, a team beat another in .6 seconds to go to the national title game, but lose and lose badly. The end of an era in NCAA Men's Hockey with the end of one conference, and the addition to two new ones. Surprising blow-outs and spectacular overtime thrillers. Most of this could be seen within the North Dakota club alone. Looking ahead to the season upon us, one must look at who left early, and from where, and who has the best incoming freshman. You have your usual suspects as one might imagine, with Boston College, Minnesota, and North Dakota probably being in the top 10 all season long, barring the typical first half North Dakota funk they always seem to have. Union, the defending national champs, is a team that I don't know what to think about. They proved that if you have a good core of players, and believe in your coach/team, great things can happen. Ohio State, they too look as if they could become a team to look at when it comes to tourney time. The Buckeyes are off of a Big 10 tournament runner-up finish, losing an overtime heartbreaker to Wisconsin. One also has to wonder about Boston University and if they will crawl back up the rankings again, or if they will stay out of the tournament picture like last season. Only time will tell. Once again, the NCHC looks to be the powerhouse conference, with the possibility of sending at least five teams to the tournament once again. Miami has their top players returning this season, and are once again among the favorites to win the conference in preseason polls. However, they said that last season too and you saw how that ended up. should be in the top five of the rankings for much of, if not the entire season. Being lead by goalie Adam Wilcox, and Kyle Rau, Minnesota is looking for banner number six to hang up in their barn once the season is over. 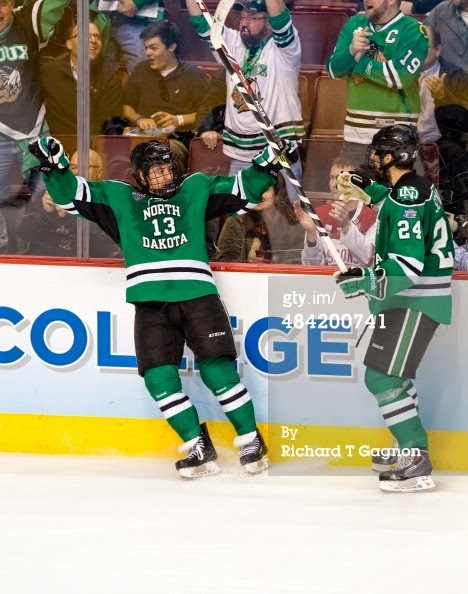 Finally, a team I know much more about, North Dakota. With three of five incoming freshman being drafted at this years NHL Draft, they return a line-up that has a lot of options. If you thought last year's freshman class was impressive, wait until you see this one. You have a stud goalie, a first round draft pick, and good core team guys leaving a game day spot hard to come by this year. Between Minnesota and North Dakota this year, you don't find much deeper line-ups in the entire country, and I know UND is looking for revenge after how their, dare I say Cinderella, season ended. If you asked me to pick a national champion right now, I'd have to flip a coin between North Dakota and Minnesota, but the season is very long and a lot can happen. Ask me this question at the start of the second half and I might have a different answer for you. The Minnesota Wild are holding their development camp on July 9-14. There will be a scrimmage on the 14th of July. Now that the development camps are in full swing, the Minnesota Gophers got some good news. Defenseman Brady Skjei will return for his junior season. By Brian Deutsch (GopherSports.com) - Gopher Hockey defenseman Brady Skjei has confirmed he will return to the University of Minnesota for his junior season in 2014-15. The Lakeville, Minn., native is currently participating at the New York Rangers Prospect Development Camp at Madison Square Garden Training Center and informed the National Hockey League (NHL) organization of his decision on Thursday. Here's a perfect example of why college hockey players shouldn't be in a hurry to leave college and play professional hockey. Even if they're a first round draft choice. Four years after leaving college, former Minnesota Golden Gopher Jordan Schroeder has played in a mere 56 NHL games and scored an unimpressive (6g-9a—15pts). I know that hind sight is 20/20, but I do wonder if Schroeder would still leave school early, knowing what he knows now? Stay in school and finish that degree. VAN will not be qualifying Jordan Schroeder or Zac Dalpe. Both go to UFA. Eric Duatschek asks some very good questions. Personally, I hope that Thomas Vanek still has a chance to make it to Minnesota. I think he could be the final piece for the Minnesota Wild. Well... that and a solid starting goaltender that can stop the puck and play a majority of the games. I think the Wild have that with Karcy Kuemper. Time will tell. Eric Duhatschek, Globe and Mail -- THE THOMAS VANEK CONUNDRUM: When times were good in Montreal, there was some talk that the Canadiens might actually consider bidding for Vanek in free agency. Now, it seems highly unlikely, given what a negligible impact he’s had on their run to the semi-finals. But will Minnesota welcome him now, after making inquiries at the deadline, but ultimately settling for Matt Moulson, because the acquisition cost and the dollars out were more affordable? Moulson wasn’t a great fit in Minnesota and the New York Islanders would do well to try and kiss and make up, after dealing him for Vanek in the first place. Minnesota has the great good fortune of having Dany Heatley’s $7-million cap hit disappear after this season, but committing that money to Vanek, a player of questionable playoff pedigree, seems ill-advised at this stage. The Wild seem to have a good thing going, with the group they’ve assembled now. Sitting out free agency this summer makes the most sense for them. One problem for Vanek is that he's been less than impressive during the 2014 Stanley Cup Playoffs. Vanek has scored (5g-3a-8pts) in 13 games. He's also a (-3). That's not going to make teams want to sign him for 7+ million a season. These are two of the biggest goals in Minnesota Wild history... Just think about this, Hall of Fame goalie Patrick Roy lost the last two games that he played in. Also, the last game of Roy's NHL career was against the Minnesota Wild. Looking at some of the names of the players, the Av's were loaded. Watching these old video, I can't imagine the NHL without HD TV. Also, I really don't miss NHL Hockey on ESPN anymore. I think that NBC and NBCSN have done a very good job with the NHL broadcasts.